Family Reunion: A Cocktails & Mayonnaise Event! Have you bought your tickets yet?? How about entered your favorite mayo dish (potato salad? chocolate-mayonnaise cake? deviled eggs?) into our Mayo Dish Cook-Off? The prizes are from some great local businesses! Don’t wait! It’s time… and we can’t wait! Learn to make wild cocktails, listen to music from a 100-year-old Victrola, and eat mayo delights all while hanging out on a farm in the middle of downtown Raleigh. What better way to spend your Saturday afternoon? GET TICKETS HERE. 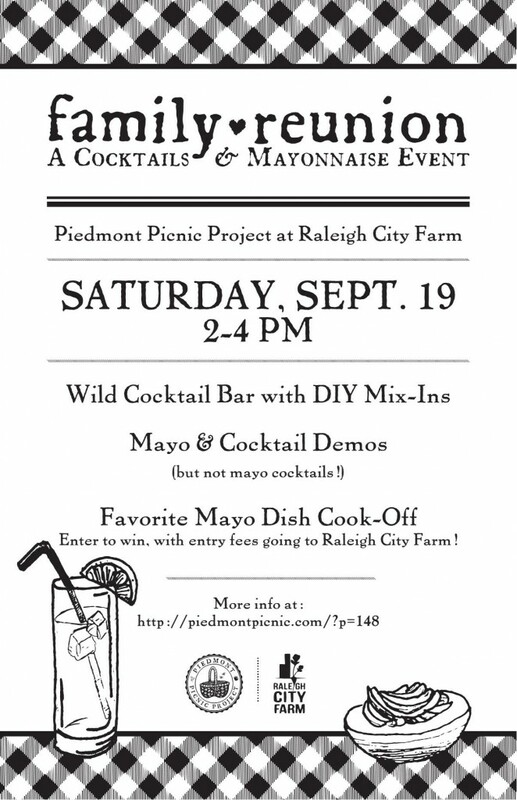 In celebration of Piedmont Picnic’s first ever event and launch party one year ago – Cocktails & Mayonnaise – we’ll be hosting another cocktails and mayonnaise event as our one year anniversary party! What can you expect? Additional drink tickets available on-site for $5 each (cash and credit accepted). Come enjoy a lovely afternoon on the farm, participate in creating your own unique foraged cocktails, and chow down on your neighbors’ best mayo recipes!